Renault has taken the covers off its new electric Grand Tourer concept at this year’s Paris Motor Show. 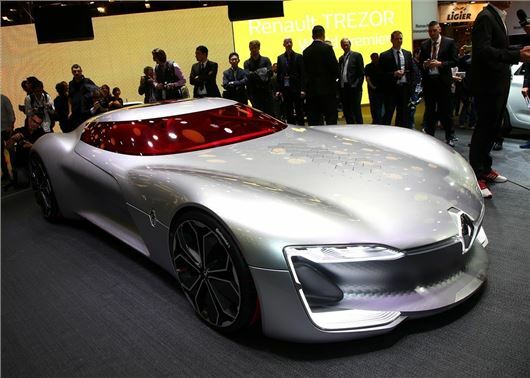 Called the Trezor, it’s unlikely to ever see the light of day – but its styling, with its over-sized c-shaped lights, does hint at how Renault’s existing car range will be revised next year. The electric motor is derived from the Renault e.dams, two-time winner of the Formula E Teams’ world title. With a maximum power of 350PS and peak torque of 380Nm, it provides acceleration from standstill to 62mph in less than four seconds. The location of the batteries is also separated for better handling and performance. One battery is at the front of the car and one is at the rear. A wide track and low stance should also offer positive handling characteristics. Inside is a new L-shaped dash display that combines the controls and the multimedia system, something which could be a feature in future facelifts for the French car maker. And the autonomous driving? Well, Renault says it is committed to making a safe ‘hands-off/eyes-off’ system available for its mainstream vehicles (at an affordable price) by 2020.